Chess and checker is interesting game that has no age limited. All people can play the game, the rule is easy and the equipment is simple. You can play it anywhere and everywhere you want it. Suitable for indoor and outdoor game in your holiday or in your rest time. Ask your partner to join the game at your garden, so you can refresh your day while enjoy the game. 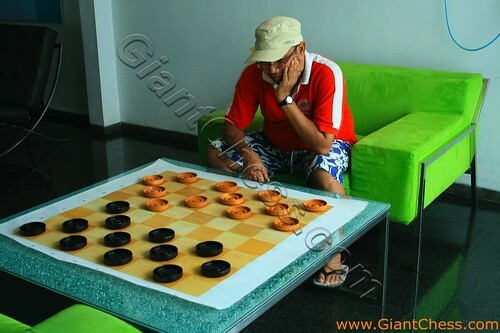 In the picture above we show you about a man that has play checker game in lobby hotel. He spend his holiday in a hotel and looking for an interesting activity. He find something interesting in lobby hotel and ask his partner to try it. Proved checker is a very interesting game to play in bored day. He thank to the hotel that has provide checker equipment set in its lobby. So, it more attractive if hotel put some checker set equipment in its lobby. Sure that the guest will love it.